In preparation for our full review of The Elder Scrolls Online, each week I'll be presenting a journal of what I've been doing in the game. Except for the previous two weeks, because those logs would have been boring. 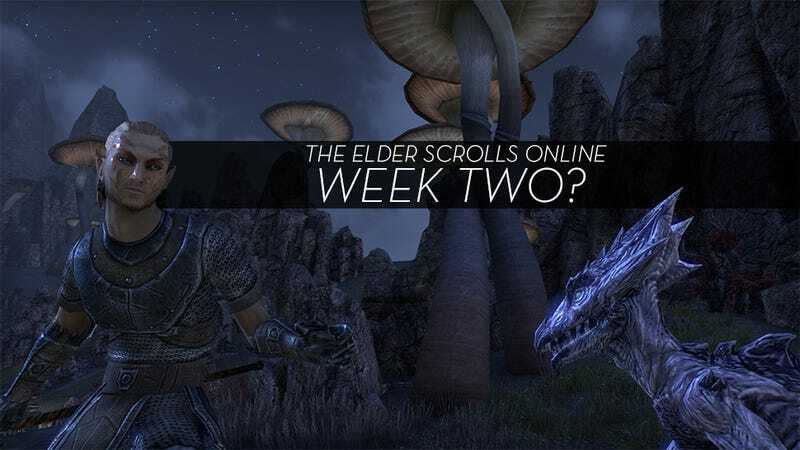 There's a simple explanation for why I hadn't played enough of The Elder Scrolls Online to fill out MMO log entries over the past several weeks, but I am going to make it as complicated as possible. Reason One — Time Constraints: I've been incredibly busy over the past three weeks, working on large projects, taking care of children as my wife deals with a strange scheduling situation at work, and handling my everyday duties. There's always the weekend (which for me is Thursday and Friday), but that's for napping. Reason Two — Bad Timing: The urge and time to play have been coming together at the oddest times. I'll grab a drink, clear my slate for a few hours, slip on my headphones and dammit, I forgot there was maintenance today. There was once instance where I got in, found a party for the Banished Cells group dungeon, and then a message popped up telling us the servers were going down. The worst timing. Reason Three — The Banished Cells: I spent many of the rare moments I managed to play standing in front of the Banished Cells group dungeon, trying to get into a well-balanced part. My main is a Nightblade — a damage-focused class. He does not heal, nor is he equipped to take on a huge amount of enemy attention. He is not a party requirement, like a tank or a healer, so he spends a lot of time running about killing the random giant bats that spawn outside of the dungeon and crying. I did manage to get into a group last night though, and we attempted the dungeon twice — first with just two Nightblades, which went horribly, and then with a party of four, none of which were healers and one of which was named "Poonbane the Joohunter." It went as well as expected. Mind the video, it repeats. Reason Four — Alts, Alts, Alts: After trying crafting, a seemingly-involved process requiring running about harvesting things without falling asleep in your chair (oops), I opted to partake of one of my favorite massively-multiplayer online role-playing game pastimes — making several alts, most of which I will never play again. Of the three additional characters, only Adharsuil the Sorcerer is a keeper. I'm really enjoying magic in the game — the effects, the strategies, the effects some more — and I can't wait to experience how powerful area-of-effect spells are in player-versus-player combat. Just hope they don't institute some sort of ill-advised AOE nerf before I get there. The alts have given me a chance to see some more of the world, at least. I still think it's gorgeous for an MMO, especially now that giant mushrooms have come into play. Reason Five — Pressure: I know, it's not a proper, Bethesda-developed game in The Elder Scrolls universe, but there are enough similarities that I want to play The Elder Scrolls Online the way I've played other games in the series — on my own terms. I want to be free to explore the entire world, from coast-to-coast, but ramping enemy strengths (and sometimes physical barriers) prevent me from doing so. I'd love to be able to play in the world for a few hours and then put it down for a bit, returning to it on a rainy day when the kids are at their grandparents' house, but this is not that sort of game. I'm paying $14.95 a month for this, and if I put it down and come back to it later, time does not stop. The world is on a 30-day time, and I feel pressured to make the most of it — and when I feel pressured, I tend to rebel. It happens in the other MMORPG's I have played as well, but the difference is they weren't built to evoke a fabulous solo experience I've had time and time again over the years. 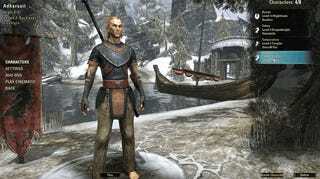 The Elder Scrolls Online really makes me want to load up Skyrim one last time. Reason Six — I'm Bored: Possibly the biggest reason. Perhaps I should have led with it. Have you ever found yourself incredibly attracted to a person — going out of your way to get to know them, making excuses to be near them, that sort of thing — only to discover once you are with them they're really just kind of empty inside? Maybe a little dumb? Completely unable to maintain a conversation? That's how I've been feeling about The Elder Scrolls Online so far. I want to play it. I want to find it fascinating and exciting. I want to experience things I've never experienced in an MMORPG before. I enter the game with enthusiasm and vigor, but soon I'm just walking through the woods again. There is still plenty for me to do in The Elder Scrolls Online. There are levels to gain, players to attempt to slay (likely failing miserably), new lands to explore and group dungeons to finally overcome once I find a group with heals. I'm not giving up on the game — I have no plans to. Just because I am underwhelmed thus far doesn't mean there's not plenty of room for additional whelm. MMORPG reviews are not built in one day. For major MMORPG releases like The Elder Scrolls Online, Kotaku spends several weeks playing the game, delivering progress reports each week leading up to the full review.